We're very happy with Coral Oaks. Mom is in assisted living and everything is great. My mom's room is very nice and very clean. They have all kinds of activities like exercises. It's a very nice place. It has a salon and everything Mom needs. I visited Coral Oaks. The staff was very informative and willing to help with what my mother needed. The rooms were very nice, came in several different sizes that were decent enough to be comfortable in, and seemed to be well kept. They had a craft room, bingo, and different outings. I visited Coral Oaks. The people that I met there were very good. The rooms were very good, and good enough for two people to live in. The facilities, the restaurants, and everything were excellent. The menu that they had in the restaurant was good. I could only say good things about it. There was nothing negative that I saw. It was clean and so on. The only thing that I did not like was the price. It was too expensive. I have visited Coral Oaks and I only met one person on the staff and she seemed very nice, have been there 16 years so I think she would be knowledgeable of it. I visited two rooms and it seemed very nice. The meal that I had on two different occasions was very good. The dining room setup had round tables for about 40 people and it was a little crowded in that room. They have crafts, play cards, recreation room that they play Wii. The Coral Oaks was a really nice place, but they don't take patients with memory problems. That was more like a country club (with a swimming pool) with a fence. The sanitation was excellent as well. The staff as well as the rooms were very nice. The people looked well dressed, well kept, and active. I went there during meal time, and they were just getting ready to board the bus to go someplace else to eat. My Mom has been a resident at Coral Oaks and unfortunately has to move due to too many increases making it too expensive to stay. They don't work with you, and it's all private pay. The care she has gotten there has been excellent. The nurses and most of the aides are wonderful, and I can't thank them enough for taking such good care of my Mom. Of course anywhere you go there might be one or two aides that really don't want to be there and shouldn't be. But overall the accommodations, activities, staff, food and care has met and in some cases exceeded our expectations. It's too bad it cost too much. The place is usually very clean, however you can walk in and there are days where it smells pretty strong of urine, but you have to visit frequently to pick up on that. Having onsite maintenance helps, but does take a while to get something fixed or done. Although Coral Oaks has been a great place for my Mom; I've found that for the money you pay, you can actually find the same or even better for less at other smaller ALFs. But we don't regret the time that my Mom has been there. Great experience for my Mom over all. What I noticed when I first arrived at Coral Oaks ALF was how nice the landscape was and there was enough parking to accommodate the staff and visitors alike. When I walked in I noticed they have beautiful wood floors, ample seating for residents and visitors. The dinning room was very spacious and since I arrived just before lunch I was able to view the menu and everything looked and smelled wonderful. Also the dinning room has a large salad bar. The resident rooms were very spacious and provided private baths, and each room has their own private balcony for the resident to enjoy. Also each unit has their own private washer and dryer. The facility offers a large swimming pool with ample pool side seating and lighting for night time swimming. There is a large library for the residents with many books and ample seating in the library. Also at the facility there is a barber shop and beauty salon. During my visit I spoke to several of the residents and each resident informed me that they were very happy at this facility. I wasn't as impressed with Coral Oaks as the other place. I just didn't feel it was updated enough. There was a certain smell and the colors of the walls were very outdated. The tour guide was awesome. She couldn't have been any better. She was really great. It's just the facility itself. They had a lot of activities on the schedule. They have everything there. We went right before Christmas so there was really nothing going on when we were there, but they have everything that the other places have too. The dining area looked like a cafeteria. They need to update it and maybe change some of the colors. I wasn't really impressed with the baby blue doors and the yellow walls. I did like Coral Oaks very much. The rooms were much bigger, but the people were just older, and that is not what I was looking for. It was beautiful, the rooms were nice, and the food was great. They did offer some activities, but no one seemed to be interested in them. Coral Oaks is very nice. It's assisted living and independent living, and they're separated. I like it very much because it's very homey, and everybody's friendly. It's not too big. I liked Coral Oaks very much. There are 2 buildings -- one for assisted and one for independent living. I looked at a 1250 square foot apartment -- 2-bedroom and 2-baths -- and it was around $3700 a month. I had a great lunch there. It was wonderful. You can have breakfast and lunch or dinner. Although they don't air condition each unit, but if you lose power, they have an area that you can go to plus another area for pets that would have heat or air conditioning; that to me is very important. Coral Oaks is very nice and very clean. The staff is efficient and kind. It just needs to have more activities and more introductions to other residents. My mother does not know anybody yet. I am impressed with the cleanliness and the nice staff. I was looking for a facility for my mother. Coral Oaks has assisted living and independent living and has the activities that she preferred over most of the other facilities. The main thing was that they play a lot of bridge at this facility, which is what my mom plays, too. The people at the assisted living can use the amenities of the independent living facility if they are able to ambulate there. They also have daily outings to different stores like Walmart, the mall, grocery stores, drugstores, and restaurants. They’ll take them to go for a drive around the area for sightseeing, to look at houses, and just to get out and ride around. They have a really nice dining room. The facility is extremely updated and clean with really nice lighting, new paint, and new carpets. Coral Oaks is a very good place, and I really did like it a lot. It’s very nice, and everybody is very friendly. I went into several rooms, and they were very well attended to. I was very impressed with the people as well. It's a nice place to go. The staff who gave me the tour answered all of my questions. They invited me to stay for lunch. They have a nice menu, and the food was very good. Everything was just fine. She gave me a calendar of activities, and it stated that they have a social activity plan. I would not hesitate to go in this place because it's very nice. About a month ago, I visited Coral Oaks. We were looking for a facility for my mom and this facility seemed very nice. I've heard good things about it. I got a tour around the facility and they have a pool which is nice. The looks of the apartments were nice and it was clean. They have a kitchenette. They also have washer and dryer for each apartment. They do the laundry for people there once a week. They have a lot of various activities, like bingo, dancing, music, entertainments, and arts. I don’t have any complaints about the facility; mom is just not ready to move here in Florida yet. Coral Oaks was very nice. We were able to eat there and the food was fine. They don't have more advanced services when maybe our health is not as good as it is now so we prefer others that provide those services. Features Extra: Library, Fitness Room/Gym, On Site Bank, Card Room, Movie Theater, Jigsaw Puzzle Room, Billiards Room, W/D In Apt. Licenses: Limited Nursing License in AL. Coral Oaks is Palm Harbor's Best Retirement Living offering full service community with Independent Living and Assisted Living. Resort style setting for those who want to simplify from the demands of maintaining a home. We are located within a few miles from Clearwater Beach, Honeymoon Island and Tampa International Airport. We are only steps from local shopping and restaurants. 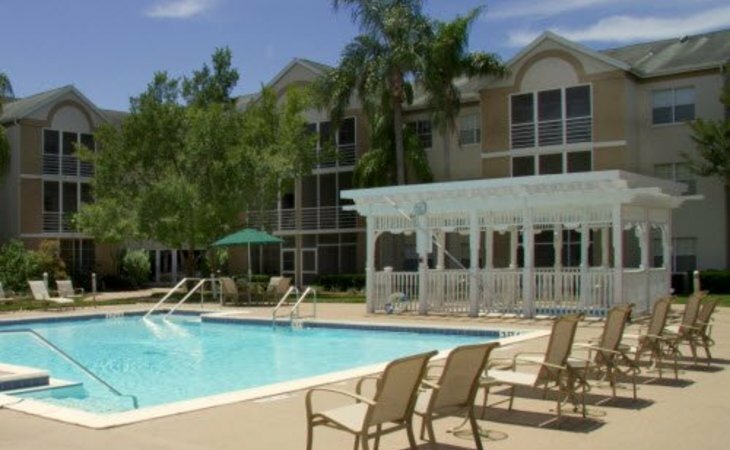 An array of amenities are available, including resort style heated pool and whirlpool, exercise room, billiards room, internet lounge, library, walking paths, beauty/barber shop, card room and washer/dryers in every unit. Services included are Chef-prepared meals, housekeeping, transportation, activities, 24-hour security and utilities. Join us for a complimentary tour to see why so many call us home. What should caregivers and potential residents know about Coral Oaks?